For the first time, Grenada hosted the joint Russian/Eurasian-Caribbean Forum on Economy, Media & Academics, ‘A New Dawn 2017’ at the Radisson Grenada Beach Resort. The forum took place from 1 to 3 November, and saw representatives from St Kitts & Nevis, Antigua, Guyana, Jamaica, Cuba, United Kingdom, United States of America, Uruguay and Russia. Grenada was in charge of the Business Circles, and Russia’s Dr Brilev was in charge of the Media, Universities & Academia and Political Scientists. Deputy Director of the TV Channel ‘Russia-1’ and President of the Dawn.gd, Dr Sergey Brilev, stated that in April 2017 he found out that Grenada was the lone Eastern Caribbean country to open an embassy in Moscow, Russia. With this new-found knowledge, he met with Minister for Health, Social Security and International Business, Hon Nickolas Steele and the Prime Minister Dr the Rt Keith Mitchell that month. There, he established good relations with them and was able to produce a special report on his television programme back home in Russia, which produced very high ratings. The award-winning anchor also runs an NGO in Uruguay, which specialises in Russian/Latin American Relations, and he thought it fitting to do something in Grenada. Dr Brilev was able to secure sponsorship, contacted Pure Grenada, Government of Grenada, the Housing Institute and other stakeholders to create this first-ever congress between Russia and the Caribbean Community. 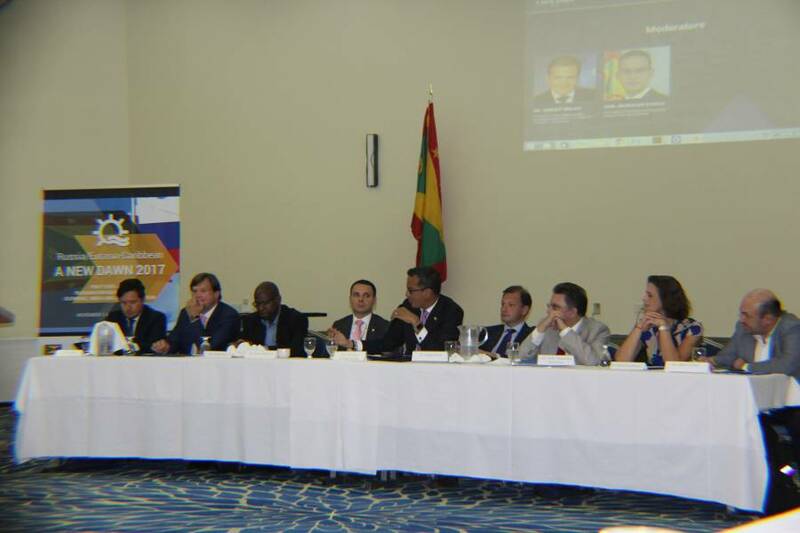 There were over 15 speakers for the duration of the forum, including Grenada’s Ambassador to Venezuela Hassan Hadeed, Minister Nickolas Steele and Cuba’s Ambassador to Grenada, Maria Caridad Balaguer Labrada. The forum also gave birth to what Dr Brilev referred to as Club St George’s to establish a permanent channel for continued dialogue and relations between all involved. Please pay closer attention to the spelling of countries such as Uruguay and not Uraguay.